Boarding Time: 20 minutes before departure. 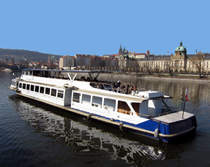 Experience the magnificence of Prague on New Year's Eve with a delightful dinner river cruise through the heart of the city, as a live band entertains you with a selection of jazz music and popular tunes. Many of Prague's famous sights border the river, and participants will experience unparalleled views of the city lit up against the night sky. Attractions include: Prague Castle, Charles Bridge, Rudolfinum, Prague Parliament, the Lesser Town, the National Theatre, Dancing House and Vysehrad. On arrival you will be offered a welcome drink and shown to your table in the heated interior of the boat. As the trip gets underway, a sumptuous buffet dinner is laid out, featuring a range of hot and cold food choices. The food is also freshly replenished throughout the evening. The bar on board serves a range of beers, wines, sparkling wines, spirits, and hot and cold soft drinks. Tip: Order house wine by the glass - it's pretty good, and at around £2.50/€3 for a large glass is cheaper than ordering by the bottle! While you dine and take in the sights, the band strikes up, playing gentle background tunes. As the night progresses, the tempo increases, and you may wish to take to the dance floor. Otherwise, sit back and enjoy the atmosphere of this special night. Approaching midnight, we cruise to Charles Bridge, the central point of celebrations on the river. Make your way up on deck to watch fireworks over the city from this unique vantage point. And toast in the New Year with your glass of sparkling wine. Note: This is a good, highly enjoyable cruise, which some customers return for several years running. But it is not as luxurious as the considerably more expensive cruises in, for example, London or Paris. Come with that thought in mind and you will have a thoroughly good evening. The Jazz Cruise has run for 16 years on New Year's Eve. It is exclusive to Prague Experience and cannot be booked anywhere else. It also always sells out, so advance reservations are essential. If you prefer a disco rather than a jazz band, we also offer the Party Boat. For information on the night in general, read our guide to New Year's Eve in Prague. -Top deck views of the fireworks.